KAMPALA. The Catholic Diocese of Hoima is set to lead the way as the world celebrates this year’s Uganda Martyrs Day festivities at Namugongo Shrine, Kampala, on Saturday. Hoima Bishop Vincent Kirabo Amooti will lead the sacrifice of Mass, the climax of the celebrations. According to The Rev Fr Jude Ssemambo, the 2017 celebrations spokesman, everything is set for the day. “The liturgy and other teams are ready and we are only waiting for the day now,” he said. On Saturday, Bishop Kirabo led the curtainraiser ‘Martyrs Walk’ from the Munyonyo Martyrs Shrine to St Balikuddembe in Old Kampala. 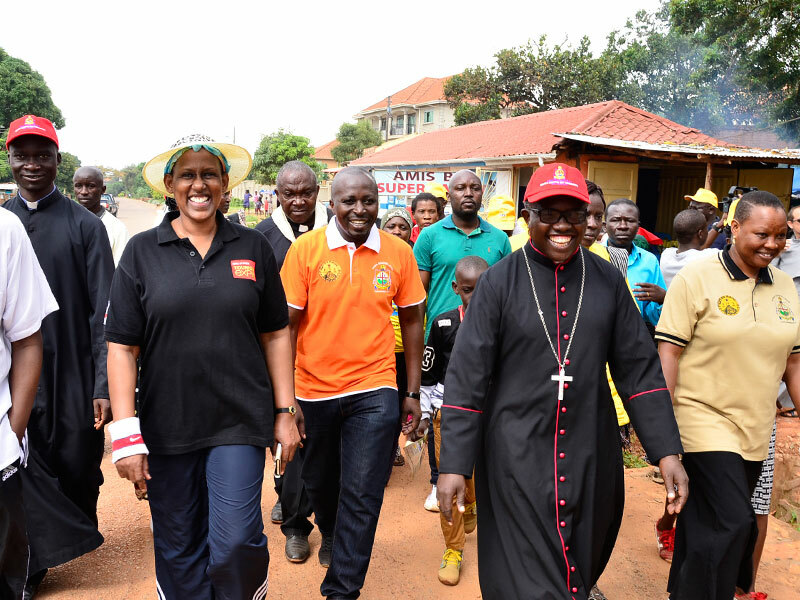 The bishop, who braved the scorching sun to the finish, was accompanied by pilgrims and government officials including minister Kasirivu Atwooki and Tourism ministry permanent secretary Doreen Katusiime. Fr Ssemambo and Kampala Metropolitan Police Commander Frank Mwesigwa address a security news conference at Namugongo on Tuesday. At Namugongo, where the celebrations will take place, security was tightened up on Tuesday with President Museveni expected to attend the Nyerere Prayers on Thursday and also expected to be chief guest on June 3. Thousands of pilgrims were trekking in as buzz of activity engulfed the Catholic Shrine. Fr Ssemambo appealed to the public to always help the pilgrims trekking on foot from all corners of the world, by giving them any assistance – be it – refreshments, shelter or directions. Fr Ssemambo appealed to motorists to be considerate on the roads such that we don’t lose lives of the trekking pilgrims. According to Fr Ssemambo, the mass on Saturday June, 3 will start at 9.30Am prompt.